As you may know, in the 4.01 patch, Blizzard instituted a number of throttling measures to chat channels (to prevent spamming). In the patch notes, there was no mention of this applying to sent mail messages; however, it appears that there was a server-side undocumented change that now limits the number of outgoing mails. As a result, MassMailer is effectively dead. In the past, I have made statements in defense of MassMailer to the effect of, "MassMailer is just using standard WoW API; if Blizzard doesn't want me doing this, they would change things to break the addon." Well, frankly, it appears that they have done just that. As a result, I can no longer develop an addon that Blizzard is obviously discouraging. The purpose of MassMailer has always been to support guild and team communication-never spam-so I will not write something that is actively circumventing the security measures that Blizzard has placed in the game to protect the privacy and security of its customers. Any work-around would probably involve adding a delay between groups of messages to reset the server-side count. Doing this would make sending messages a lengthy and frustrating process. In full disclosure, lately I have had a pretty limited amount of time to devote to video games. What time I do have, I'd like to spend playing rather than writing code (which I do all day). I've had a lot of fun developing MassMailer, but I don't think I could continue to give it the level of attention and support that it deserves. However, if anyone is interested in taking over the project to continue to develop it in a more officially-sanctioned way, I'll be happy to provide you with all the materials necessary to do so. 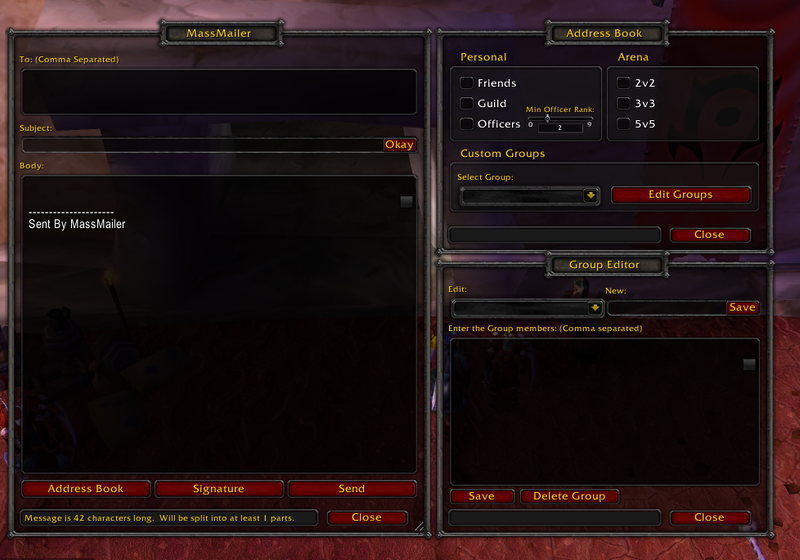 MassMailer was created to fill a a gaping hole in in-game communication and to facilitate the communication between players and group leaders. I think it's a little short-sighted on Blizzard's part to prevent the continued development of such addons, but, alas, such is life. I sincerely hope that Blizzard will either reconsider its position (since I've never found mail-based spam to be at all a problem) or create an improved method for communicating with offline guild and team members in a more officially sanctioned way.